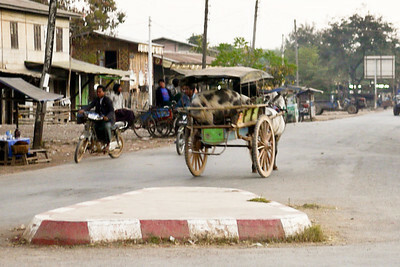 A horse-drawn cart with a pig in the back makes it way toward Nyaung Shwe on Inle Lake from the bus stop in Shwenyaung, Burma. 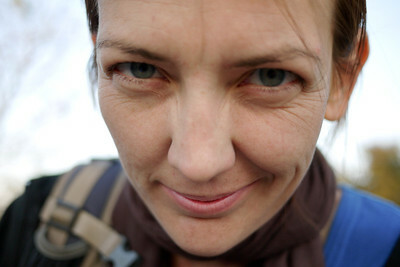 Ana experiments with the camera as we wait for the bus from Nyaung Shwe to Mandalay. 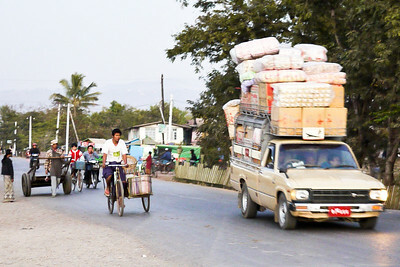 Busy traffic bustles by the bus stop in Shwenyaung as we wait for the bus to Mandalay on the side of the road. 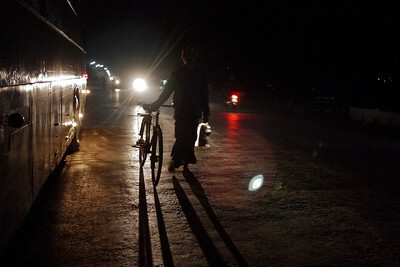 A lone biker makes his way on the dark road in Shwenyaung as I wait for the night bus to Mandalay. 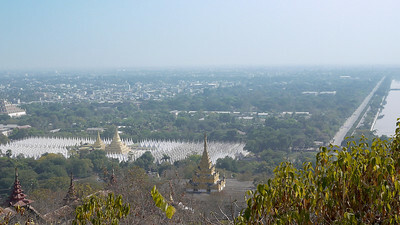 The view of pagodas and temples from Mandalay Hill, Burma. 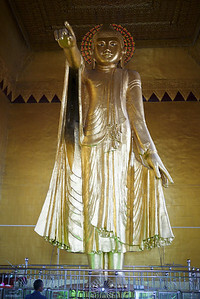 A Buddha statue pointing the path on Mandalay Hill, Burma. 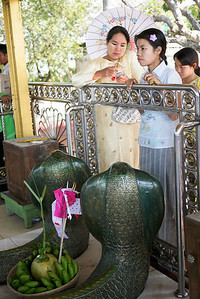 Women give offerings to the serpent Naga spirits on the top of Mandalay Hill, Burma. 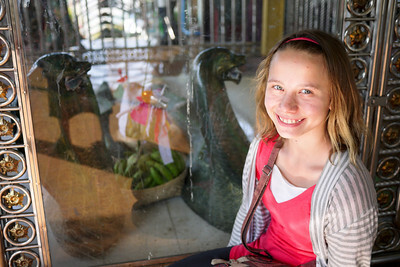 Enjoying the sweeping views of the city from Mandalay Hill, Burma. 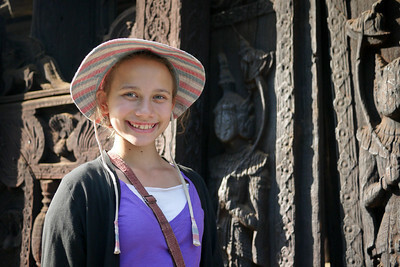 Ana and the spirits at Mandalay Hill, Burma. 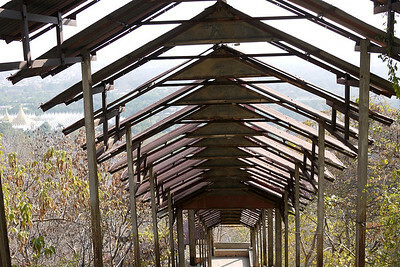 Making our way up the steep side of Mandalay Hill, Burma to the very top. 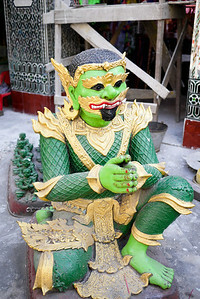 One of the Burmese Nat at the Pagoda on the top of Mandalay Hill, Burma. 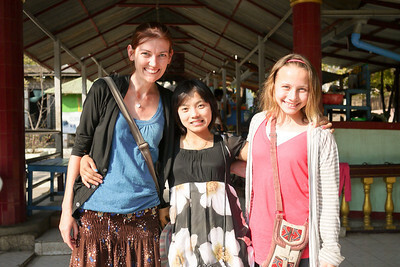 Taking our photo with friendly locals on Mandalay Hill, Burma. 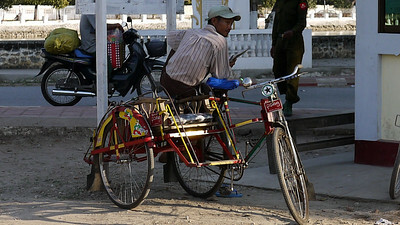 Our trishaw driver in for the day in Mandalay was a very smart and sweet man willing to show us a full day of sightseeing around the city. 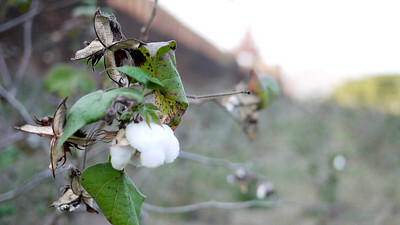 Fresh blossoming cotton near the Madalay Palace. 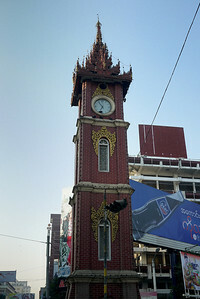 Clock tower inside of Mahamuni Paya in downtown Mandalay, Burma. 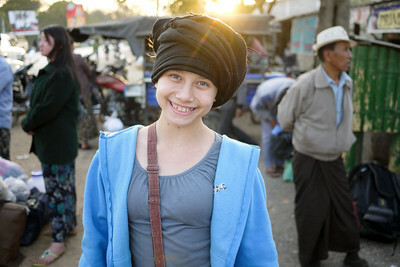 Goofing off and playing with scarves as we wait for the bus to Mandalay. 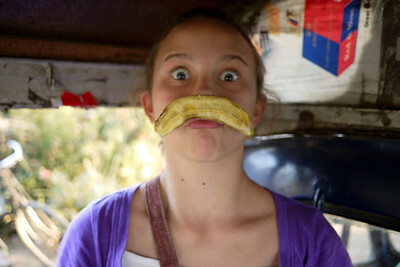 Ana and our friendly trishaw driver through Mandalay. 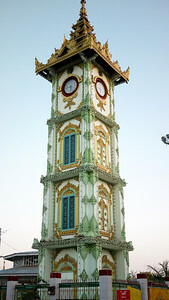 The tall clocktower in Mandalay, Burma. 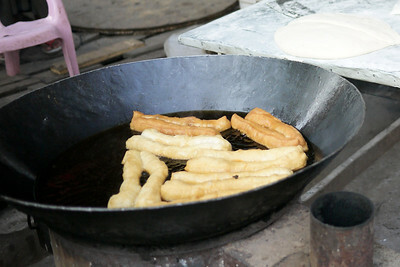 Fresh fried dough from a street vendor in Mandalay was a special treat one morning! 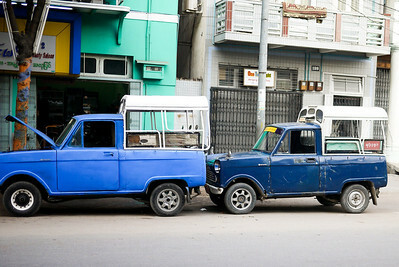 Small blue taxis were a cheap and easy way to get through the city. 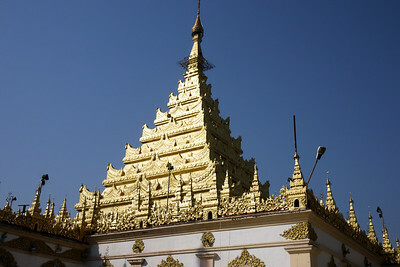 The top of the Mahamuni Pagoda in Mandalay, Myanmar. The progression Mahamuni has gone through over the years. 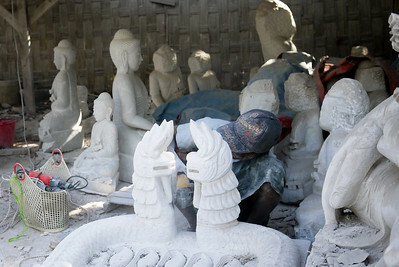 A stonecutter is hard at work on the streets of Mandalay. 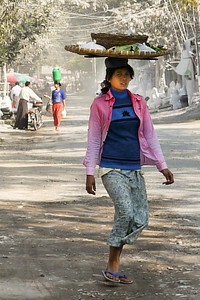 A woman balances snacks on her head for sale as she makes her way through the streets of Mandalay. 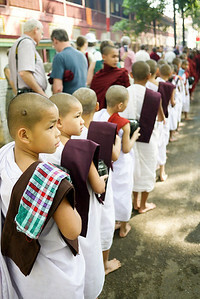 Young monks line up in rows and prepare for lunch at 11am at the Maha Gandayon Monastery in Mandalay, Burma. 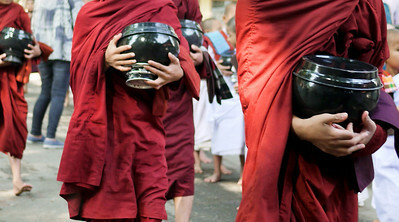 Monks take their earlier alms offering to the table as they line up for lunch at the Maha Gandayon Monastery. 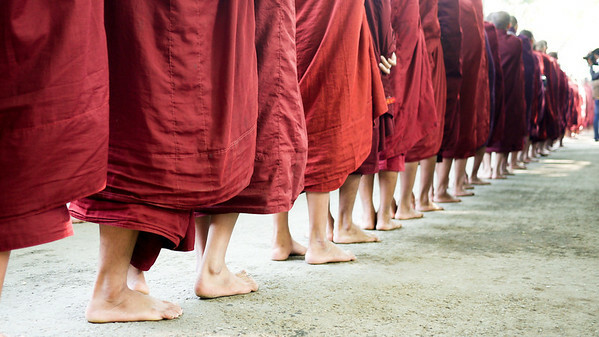 A line of monks at the Maha Gandayon Monastery in Mandalay, Myanmar. 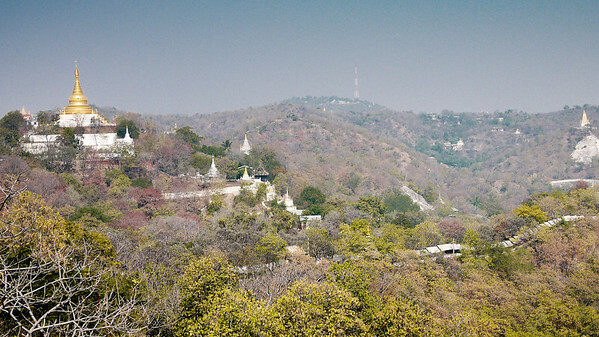 The views from the top of Minguin temple, a short day trip from Mandalay, Burma. 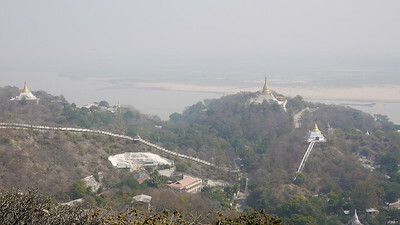 Views of the Irrawaddy River from the top of Minguin temple, a short day trip from Mandalay, Burma. 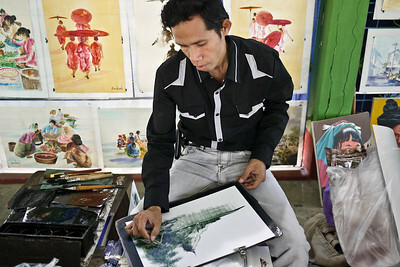 A craftsman makes a quick oil painting with a razor blade on the top of Mandalay Hill. 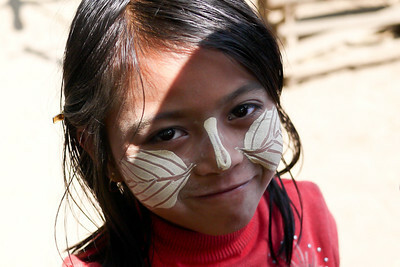 Beautiful thanaka on the face of a young girl in Mandalay, Burma. 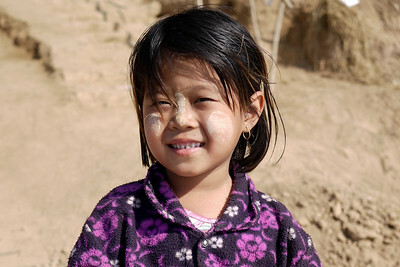 Sweet smiles from a child in Mandalay, Burma. 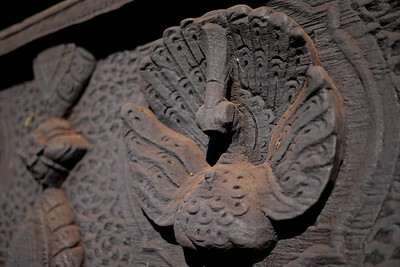 Peacock designs on the Bagaya Kyaung Monastery on Innwa (Ava) near Mandalay. 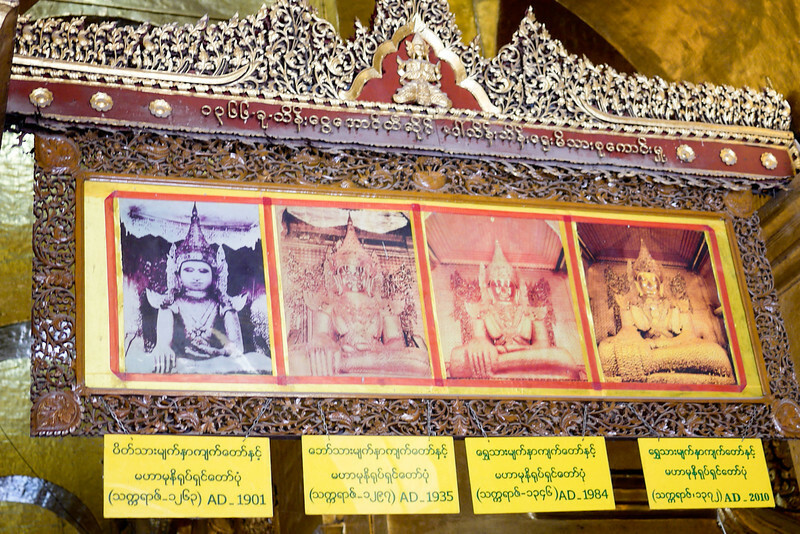 Intricate teak designs at the Bagaya Kyaung Monastery on Innwa (Ava) near Mandalay. 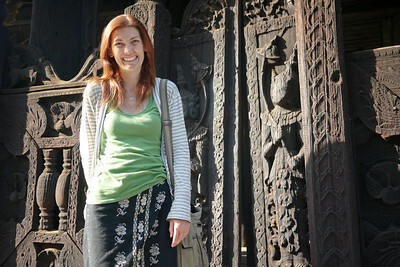 Ana poses in her longyi at the Bagaya Kyaung Monastery on Innwa (Ava) near Mandalay. 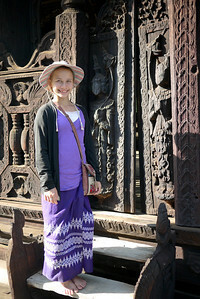 Beautiful and lasting teak carvings at the Bagaya Kyaung Monastery on Innwa (Ava) near Mandalay. Two cats cuddle at the teak monastery on Innwa near Mandalay. 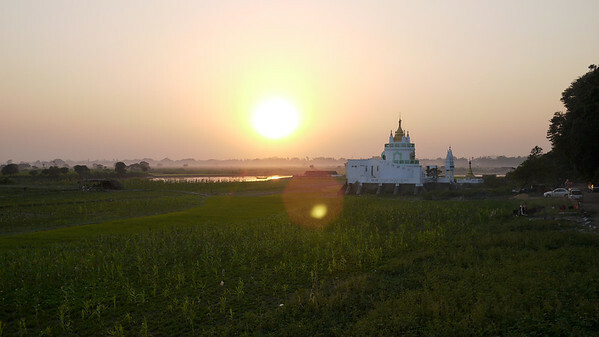 Men work in a small lake near the teak monastery on Innwa. These Burmese women were delighted by the traditional longyi Ana and I wore to the temples on Innwa. 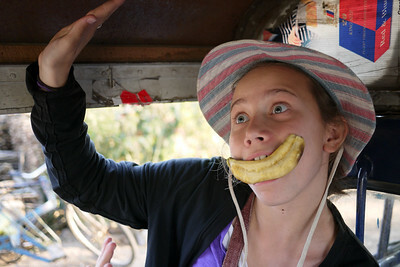 Ana goofs off on our day trip around Mandalay. 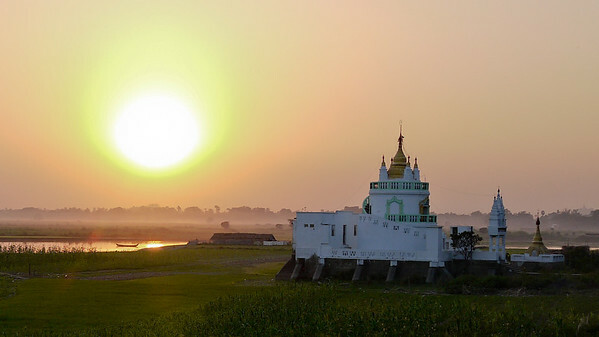 Sunset at U Bein Bridge, a gorgeous teak bridge near Mandalay.